Re-sealable packaging bags are type of packaging that allows the consumer to reseal or reclose the packaging after every use. Re-sealable type packaging bags such as zippers, screw caps and others are mainly use for products that need to be resealed in order to maintain product freshness. Re-sealable packaging bags market is expected to thrive at a notable CAGR over the forecast period. In this era, where the world is witnessing extreme pollution, solutions such as re-sealable packaging bags are expected to witness extraordinary demand in future due to their environmental benefits. The market of re-sealable packaging bags is likely to grow on the back of its advantages over other packaging methods such as it reduces waste, extends shelf life of product, and others. The market is segmented in five major regions including North America, Asia Pacific, Europe, Middle East & Africa and Latin America regions. 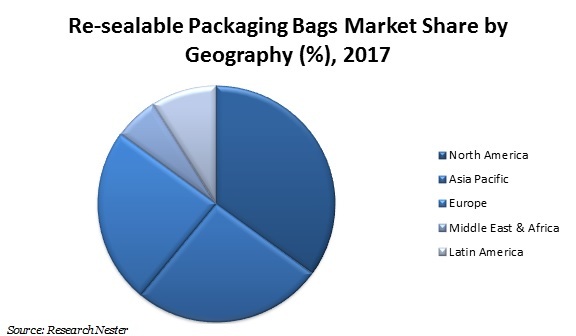 Among these regions, North America and Europe grabbed lion shares of global re-sealable packaging bags market in 2017 and is expected to maintain this lead over the forecast period. This lucrative growth in these regions can attributed to high concern among consumers towards preservation of flavor and texture of the product. Apart from this, high environmental concerns amongst population are expected to augment the growth of re-sealable packaging market in these regions over the forecast period. Further, Asia Pacific region is showcasing significant potential for future growth of re-sealable packaging bags market in this region. India and China are one of the most prominent markets for re-sealable packaging bags in Asia region owing to their increasing consumer base. The growth of re-sealable packaging bags market is thriving on the back of growing use of flexible packaging in numerous industry including medical, food & beverage, electronics and others. Further, abilities of re-sealable packaging bags to reseal, to extend product life, easy to open and easy to store are driving the demand for re-sealable packaging solutions across industries. The re-sealable packaging bags also offer some environmental benefits as compared to traditional packaging methods by reducing waste. Further, rising environmental concerns amongst population is expected to bolster the growth of global re-sealable packaging bags market in near future. Now re-sealable packaging bags are available in bio-degradable and recyclable materials and this is expected to foster the demand rate for re-sealable packaging bags globally. Apart from this, industries are using of re-sealable packaging bags to make products look attractive & modern and to provide a high level of convenience to consumers. Since the product stored in re-sealable packaging, there is no need to move product into another box to prevent its freshness. These advantages of re-sealable packaging bags enhance the consumer engagement with a brand. This factor is projected to escalate the growth of re-sealable packaging market in upcoming years. In addition to this, factors such as rapid urbanization & industrialization across the globe are also augmenting the growth of global re-sealable packaging bags market. Rising disposable income of the consumers and their swelled spending on products with better packaging are likely to emerge as a major driving factor for global re-sealable packaging bags market at notable rate. However, presence of other alternative methods of packaging is expected to act as a major challenge in global re-sealable packaging bags market over the forecast period.